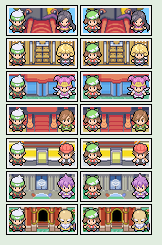 I'm also working on perfecting my Trainer Card Making, so If you want a card type a list of pokemon, and send a Trainer sprite or I could make one, or I could make a free to the public Gallery... etc. Color background? Or any Eye/Hair color changes? Hmm, I want one but I could make my own to save you the trouble.. but what is the rate of the frame per second you use? but do i have to be in ur story? SKYxShaymin wrote: Hmm, I want one but I could make my own to save you the trouble.. but what is the rate of the frame per second you use? David wrote: I want one but do i have to be in ur story? icons are the awesomeness. nice job! "I want one! But do I have to be in Story?" You could've put "I want Riley With Dirty blond hair, and Ninetales"